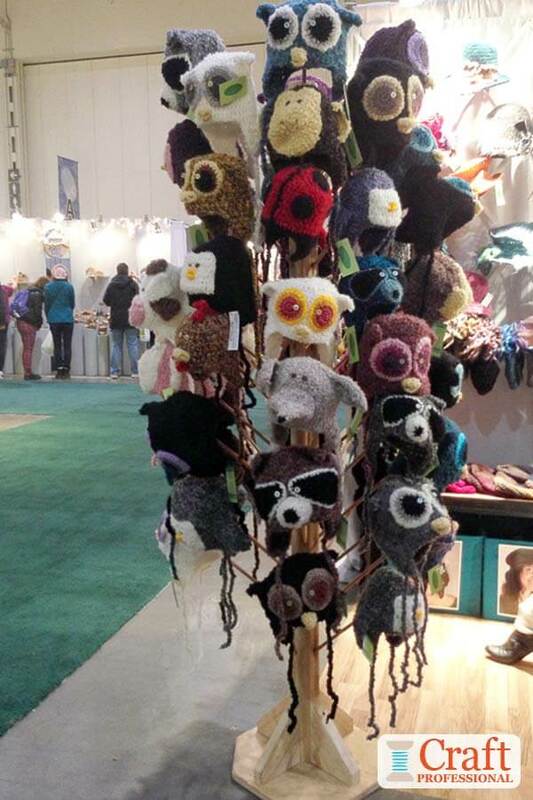 These 10 craft fair booths feature a huge variety of knit and crocheted products. 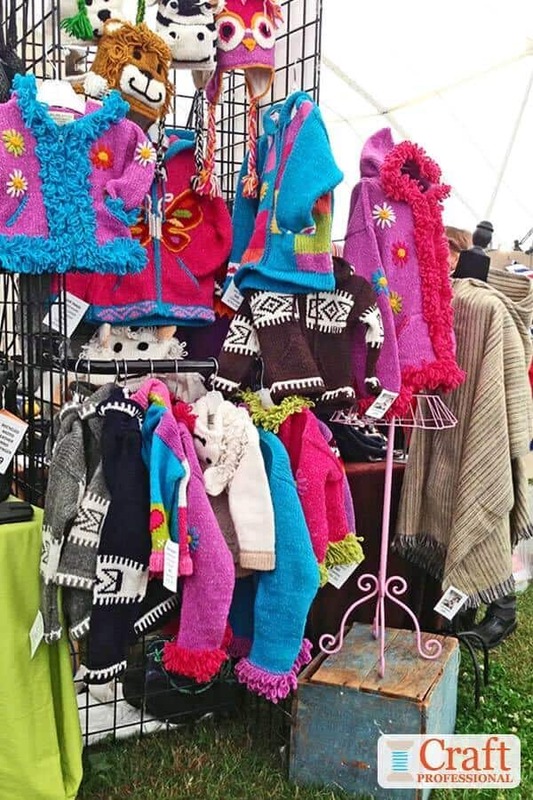 You'll find a range of everything from adult and children's clothing, blankets, pillows, hats, and scarves displayed in baskets, on mannequins, hung from gridwalls and on waterfall racks. 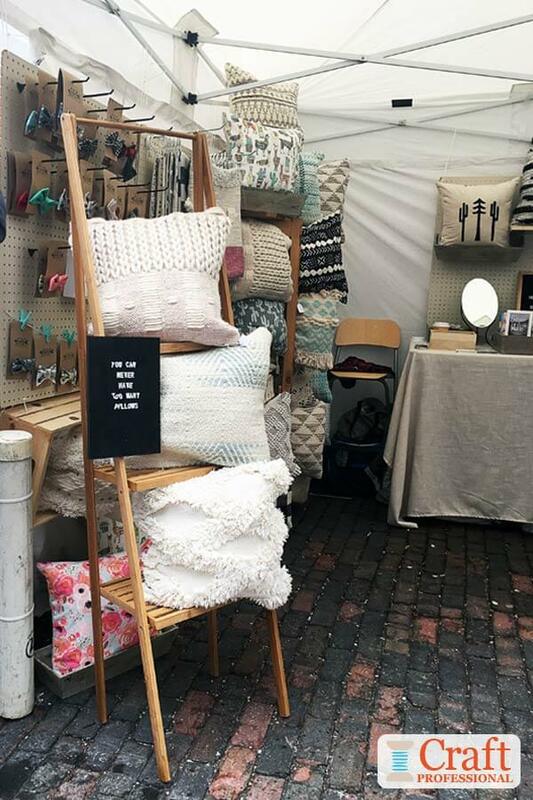 I love these gorgeous pillows (pictured below) displayed casually on a portable ladder at an outdoor show. The ladder, placed at the front corner of the booth is a great way to grab customers' attention and draw them in. The adorable sign on the ladder reads, "You can never have too many pillows." It adds a bit of fun and interest to the display. Notice the white PVC pipe you can just see in the bottom left corner of the photo. That pipe is attached to the vendor's tent and, presumably, is filled with concrete to provide much needed weight to anchor the tent in place. If you look closely, you'll see another tall portable shelf full of pillows at the back of the booth. The pegboard suspended from the tent frame provides a versatile spot to display more pillows as well as smaller accessories. 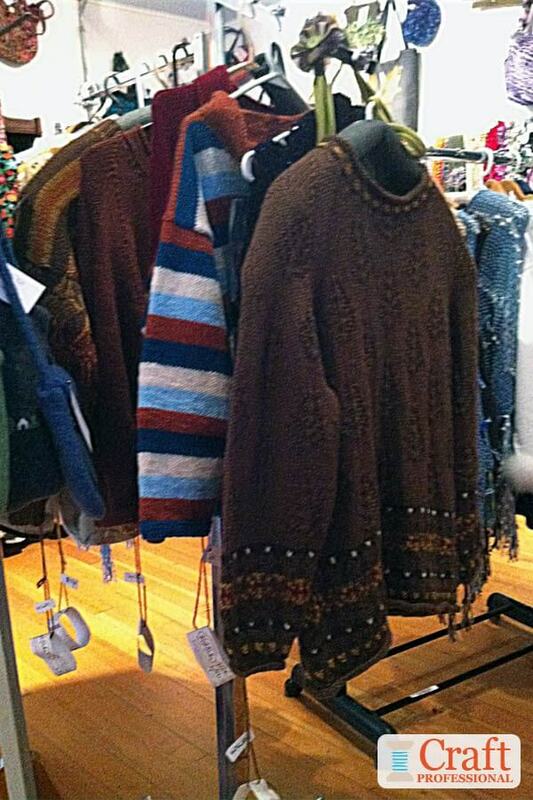 The cosy wool sweaters pictured below have been hung on waterfall style display racks. Waterfall racks are an excellent display option for any type of clothing designer, not just those who make knitwear. Waterfall style racks allow you to hang a lot of items in a small space, while keeping enough space between items so they are easy to view and don't get completely lost behind each other. They also allow you to place your most eye-catching pieces at the front, so they can grab attention instead of getting lost within the display. 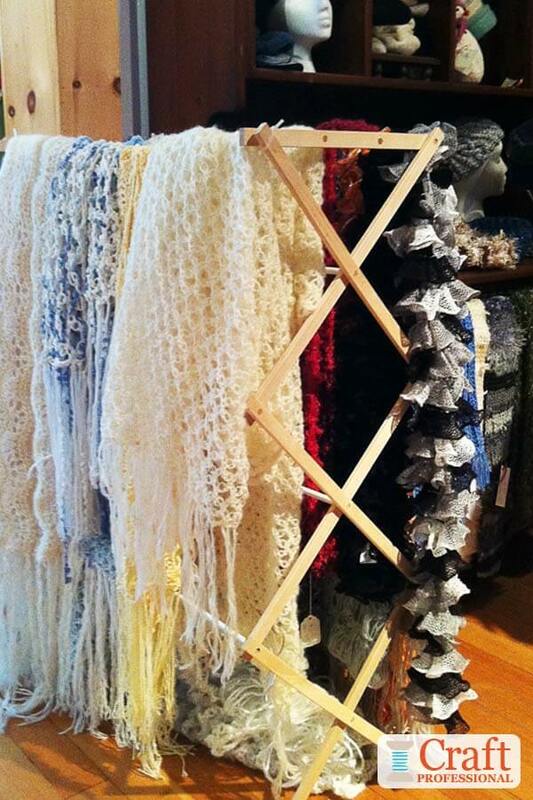 Next up, we have crocheted blankets displayed on something you might already have at home - a clothes drying rack. It's a simple and inexpensive way to to create a casual display. The rustic feel of the wood rack works with the traditional style of these blankets. If you do use a clothes drying rack in your display, just be sure to use a very sturdy drying rack! It's been my unfortunate experience that some drying racks fall apart if you just look at them the wrong way. Test yours out and make sure it's sturdy and well designed before you make it a part of your display. 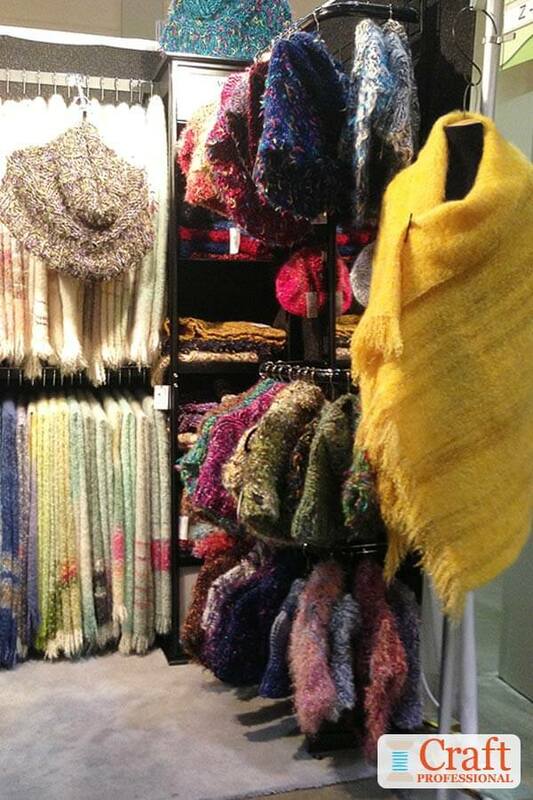 I love these beautiful shawls. The display lets the gorgeous work speak for itself. Simple is often best with large accessories or clothing displays. The products are large enough to make an impact on their own and don't require help from fancy displays. Notice the designer has turned a few of the most eye-catching pieces, to face outward so passing customers can see them easily. You can't miss that vivid yellow shawl. It is absolutely beautiful. Even if yellow is not your color, it will grab your eye and draw your attention to the booth. 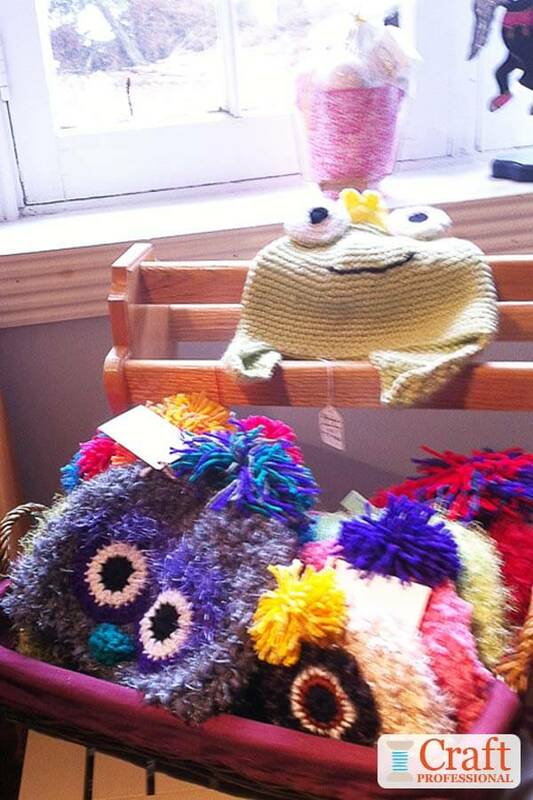 Here are some cute hats displayed in a simple basket. The display is casual and fits the product, and it's easy for passing customers to pick up items in this display. Sometimes simple is best! This hat display stand is extremely effective. 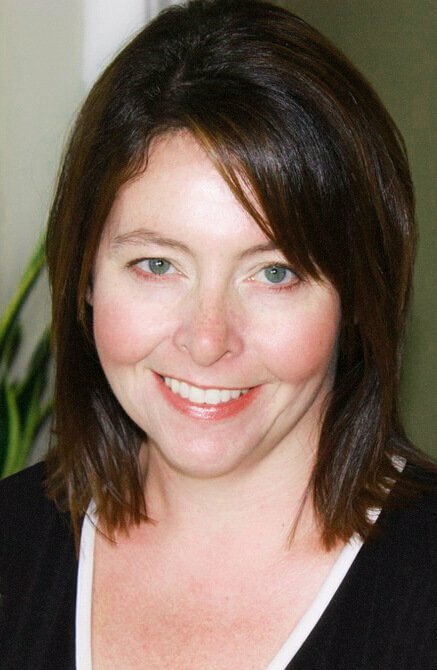 It takes smaller accessories and groups them in a way that gives them more impact and visibility from a distance. The more casual, wooden millenary stand suits the style of the hats. You can see each item perfectly. The beautiful hats aren't buried, yet the display doesn't take up too much room within the booth. 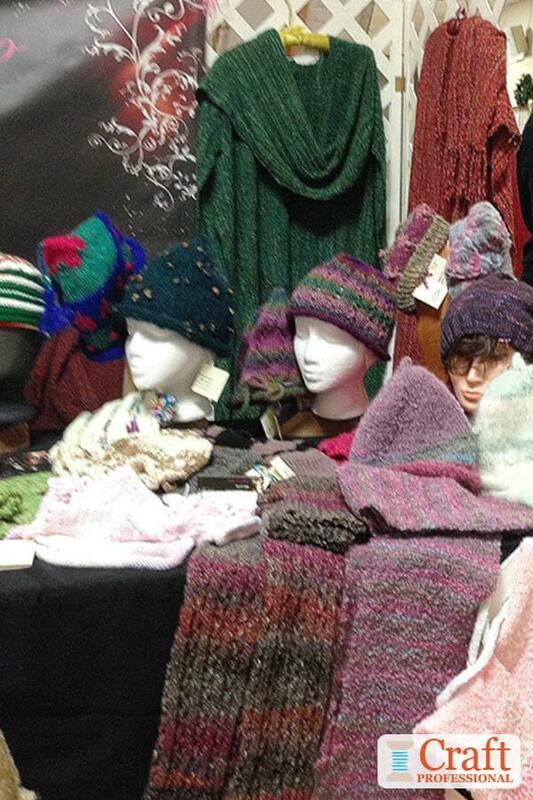 The stand can be approached from several angles, so several customers can access it at once, and it's easy for customers to pick up and touch each hat and see all of the styles available. This display using grid walls has a lot of flexibility. Notice again how the waterfall style racks (this time attached to the grid walls) provide a lot of hanging space without allowing items to become completely hidden behind each other. Wood display mannequins at the front of the display add interest and depth. 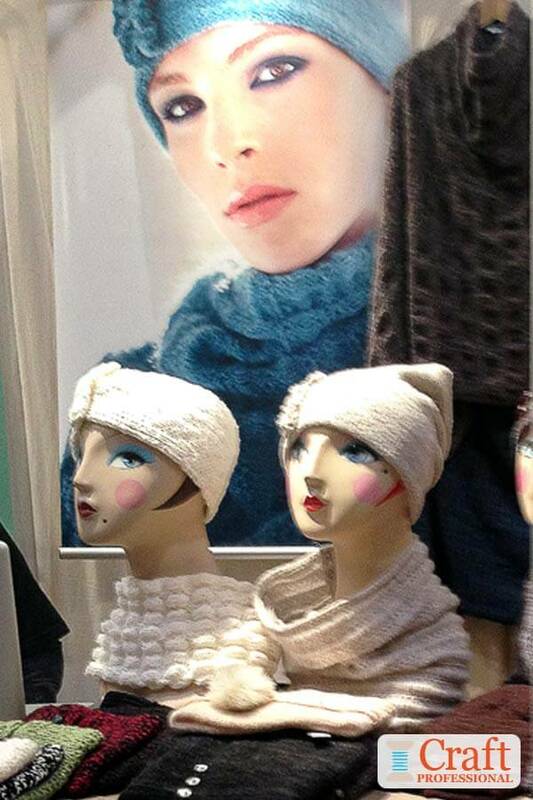 Here are some knit hats displayed on mannequin heads. The styrofoam heads are an economical choice that works within this small, local craft show. They keep the booth looking clean and simple with the focus on the hats, not the display. This next booth uses more realistic mannequin heads to good effect. These heads are less economical than the styrofoam heads pictured above, but they do create an effective look. Notice the large poster that helps customers see the hats from a distance. This booth is a cohesive whole, even the mannequin heads have a similar look to the model in the poster. 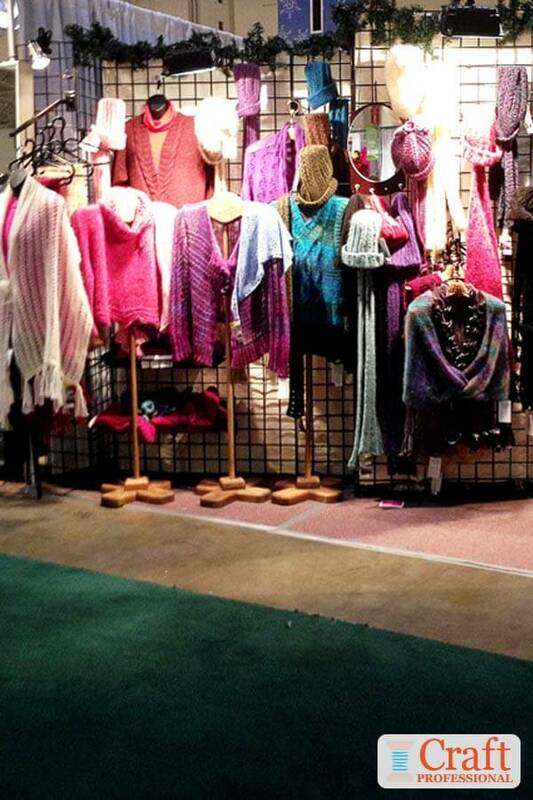 Here's another booth using a gridwall display, this time to display children's clothing. 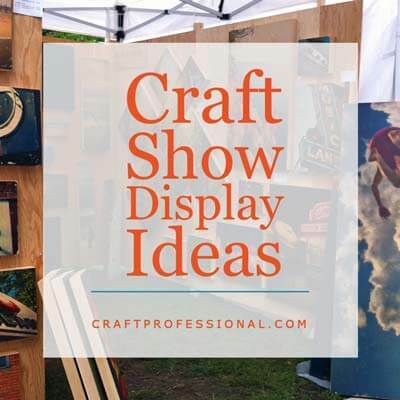 Gridwalls really do create a lot of options for displaying items you'd like to hang. The whimsical pink metal display stand is perfectly suited to this brand's aesthetic. 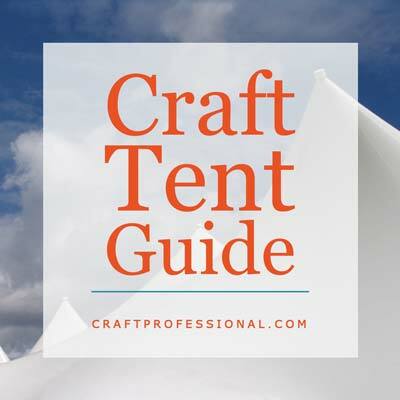 In the market for a new craft tent? Here's what you need to know. 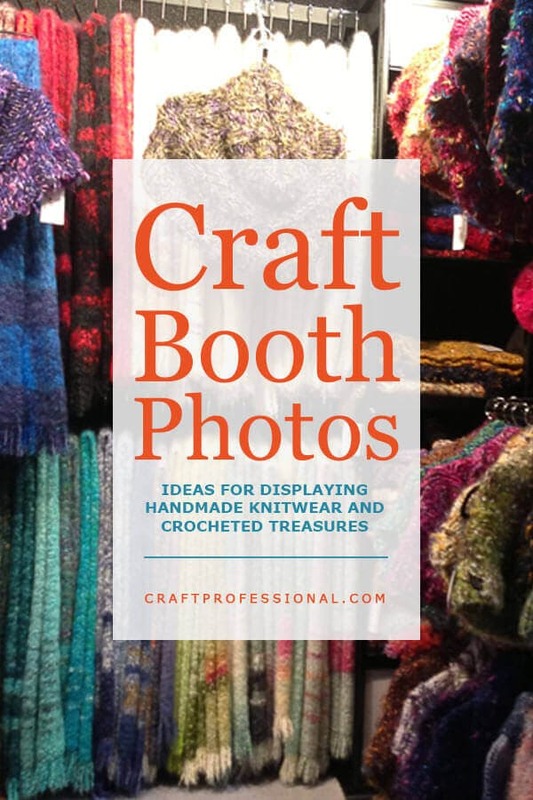 Looking for more booth photos? Start here. 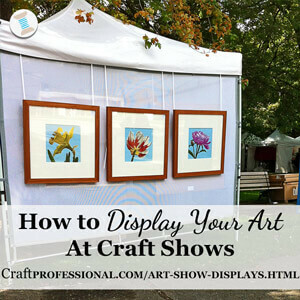 How to display your art and craft shows.